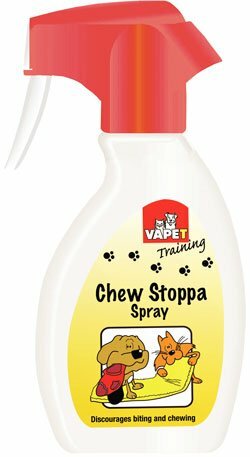 VAPET Chew Stoppa spray is a non-toxic bitter tasting formulation to help prevent your cat or dog chewing on textiles around the home. Especially effective for teething cats and puppies. Chew Stoppa spray can also be applied to dressing or bandages on the pet to prevent them from further irritating wounds or injuries, especially after medical treatment. – Apply to Dressings(stops chewing).